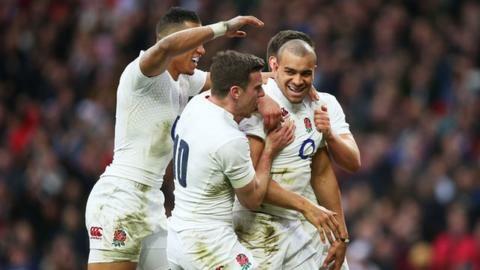 After the unexpected delight for England supporters of last week's stirring comeback victory over Wales, Saturday's 47-17 win over Italy appears a predictable pleasure: six tries, some scintillating running, a 21st victory in 21 contests between the two. Then you look at the statistics, and a more complicated picture emerges: a 30-point winning margin but less possession than Italy, less territory, more tackles missed and fewer line breaks made. Nit-picking or nagging doubts? That is the problem with thrilling wins like the one in Cardiff: they inflate expectations, convince the giddy that a team is not just ascendant but untroubled. England started slowly, again, and were once again behind with a quarter of the contest gone. They then took control for half an hour, played with pace and imagination and considerable verve, and were out of sight by the time Italy staged their late and immaterial fight-back. That will be enough for some. In the corresponding fixture two years ago Stuart Lancaster's men were held try-less. In Jonathan Joseph they had not only Saturday's outstanding performer but a young dancer and dasher who is terrifying defenders and delighting supporters every time he is given the ball. Lancaster, for one, wants more. Miss 22 tackles in Dublin on Sunday week and he knows dreams of a Grand Slam will remain exactly that. Give away breakdown penalties to a side with a player who can kick off the tee - Ireland's Johnny Sexton will not be as profligate as Italy 10 Kelly Haimona - and it will be a far steeper road back. For George Ford, man of the match in the Millennium, this was a different sort of challenge in a different sort of match. So far in his nascent Test career the 21-year-old fly-half has had to deal with a disorganised Samoa, an Australian pack going backwards at pace and a giant Welsh back-line determined to dent both his confidence and body. A week ago there was plenty of kicking from hand, a resolve under intense pressure, a premium on his penalty points. On Saturday he could have missed every effort from the Twickenham turf and still seen his side win with something to spare. Instead it was all about the attack - controlling the tempo, choosing his options, freeing the talent outside him. He began well, clearing from his own line off his weaker foot after Ben Youngs' poor pass had cut his time and space. A minute later he was putting a probing kick deep into Italian territory, dabbing another into the 22 only to see it gathered to begin the move that led, 70 metres and two minutes later, to Sergio Parisse's opening try for Italy. Ford, as the win over Wales showed, is not cowed by early disappointment. It was his precision long-range penalty tight to the corner flag that set up England's opening try through Billy Vunipola's line-out drive, his ability to play flat to the gain-line that was creating options for the runners and ball-carriers cantering in support. Not always did he make the right choice. Half an hour in he wasted turnover ball with a poor kick straight down the gullet of his opposite number Haimona. At other times he became a fraction static, passing the ball standing still rather than running at the defensive line to commit and confuse defenders. But in his vision and hands he has what England fans crave from their number 10: creativity, a little conjuring, the quickness of mind and foot to make it count against a well-drilled defence. So it was in the move that led to Joseph's second try. He hung behind his pack, hinting that he might drift down the blind-side, then scything back round to the open spaces on the right after Billy Twelvetrees had come in at first receiver. Twelvetrees timed his pass behind Luther Burrell, and then Ford worked his magic - spotting Anthony Watson drawing one defender wide, faking a quick pass outside to Joseph and then delaying it a fraction as the covering man committed, before popping up a pass for his Bath team-mate to come onto at full pace. After the conversion he was gone, replaced for the final hurrah by another creative mind in Danny Cipriani. But the learning-curve continues, his precocious talents an increasingly pivotal part of Lancaster's plans. His personal stats were solid rather than spectacular: 15 points, just one kick missed from tee from seven, 47 metres made with ball in hand, 31 accurate passes. His kicking style requires a little further fine-tuning, even if he has improved markedly in the last year. There is so much there, and at such a young age, that few doubt that the progression will continue. There is the character, preternatural yet visible from the moment he began playing in England's age-group teams ahead of his time. There are the little details, like the way he manages to almost imperceptibly shift his weight in contact to ride out or roll big tackles. And there is ambition: this is not enough, I must do more. There is also a connection with the key men outside him. Joseph made more metres (123) than any other player, beat five men in seven carries, made two clean breaks. It was Ford's pass that set him away both times. Together with the solidity of England's set-piece, the impact of their replacements and the form in other key positions of Chris Robshaw and Ben Youngs, it means England are aware of two things: they must aspire to better still, but they have the tools to get there.